You often hear about lottery winners and the way that their lives change after they have hit the jackpot, but there are few stories where the truth is really is stranger than fiction. So often the first thing that comes to mind is that a lottery winner must have been "lucky", but that isn't always the case. There are some lottery winners who, it turns out, weren't so lucky after all. Like 73 year old Carl Atwood, of Elwood, Indiana, who died within hours of winning $73,450. While out for an evening stroll, Carl decided to visit the grocery store where he had purchased his winning ticket. Tragically, Carl was struck by a truck while crossing the street. The grocery store was a block from his house. If that's not some terrible luck, then consider William Post. 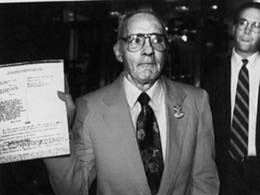 You'd think that $16.2 million dollars would be enough for anyone to live comfortably on, but when Pennsylvania native William Post won his state's lottery, he declared bankruptcy within years and lived the remainder of his life on social security and food stamp benefits. William's girlfriend successfully sued him for half of his winnings and won her court case. His siblings convinced him to open a car dealership and a restaurant, both of which lost money. He even had a brother who was arrested for hiring a hit man to kill him, hoping that as an heir he would receive some of the proceeds of the lottery. If it is rare for lightening to strike twice, then it is even rarer to be a lottery winner twice. Just ask Mary Wollens of Toronto. Lots of lottery winners claim to have either dreamed of winning the lottery, or having the winning numbers come to them in some sort of vision. Mary Wollens is one such person. A habitual lottery player, 86 year old Mary played the same numbers year after year, week after week. But after having a dream about “a lotto ticket and a large cheque,” Mary was so certain that the she was going to win the lottery that she went out and bought a second ticket. While it might seem a bit odd or a risky waste of money to purchase two lottery tickets with the same number for the same drawing, but for Mary it paid off big. Mary claimed two-thirds of a whopping $24 million dollar jackpot. I don’t know about you, but I certainly wouldn’t mind having a dream like that, one that would result in winning the lottery!